Hugh Webb and Bessie (Tidwell) Webb were united in marriage on October 3, 1927 in Yell County, Arkansas. Ten children were born in their union five boys and five girls. All were born in Arkansas with the exception of the oldest and he was born in Oklahoma. Mom had a full time job as Mother and housewife and Daddy worked at several jobs. He worked as a sawmiller for a few years and then as a farm laborer. Later in life he worked as a Sheet & Metal Construction worker until he became disabled. Daddy and some of my older brothers and sisters used to cut pulp wood. I don't know too much about this type of work, but my sister Polly told me it was where you take big trees and skin the bark off of them and then they are cut and loaded onto a truck and shipped to parts unknown. After Daddy left the sawmill, Polly said they had heard several compliments on his work and was told he was very good at it. In 1949, we lived in Althimier, Arkansas and Daddy worked for Ty Cobb on a farm. We then moved to Texas in 1953 to a town called Friona and there he worked for Mr. Black for several years. Mom always said that no one could plow a straighter row in a field than Daddy. According to Mom, Al had this same talent. Mother and Daddy both came from large families. 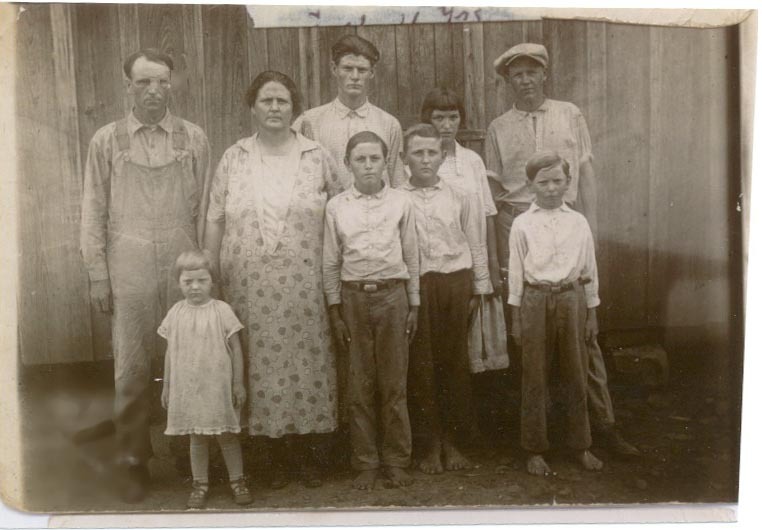 You can see a picture of Grandpa & Grandma Webb, Daddy and Mother, and Daddy's brothers below. The Webb's come from a musical family. 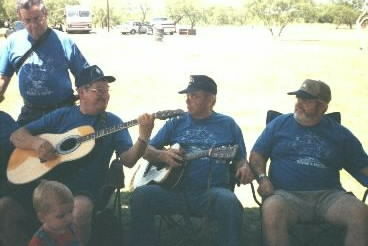 Daddy and his brothers used to play all sorts of musical instruments. As my brothers grew up they too learned to play guitars, pianos, fiddles, steel guitars, dulcimers, drums, etc. All of us sang and when we got together it was just a natural thing for them to get their instruments and play, and everyone sing. Raised in the country, we were country music fans, but also sang some old time religious songs. As years have gone by we have ventured out into other types of music, but always go back to what we were raised on. Below is a picture of a few of my family members singing and playing at our last reunion. Pictured are: Art Smith (Joyce's husband, Larry, Bob and Al and Brennon (Larry's grandson). Each year we have not only a Annual Christmas Party, which is held at one of the brothers or sisters homes, but we also have a yearly reunion. For the past several years we have met at Lake Pauline at Quanah, Texas. When our reunions first started "all" Webb's attended, but now it has dwindled down to just my brothers and sisters and their families. Still, by the time you have 10 children and their families, it makes for a fairly large group. The ladies in the picture above are my sisters-in-law. From left to right are Tempey (Bob's wife), Rhonda (Sam's wife), Kathy (Al's wife), and Juanita (Wayne's wife). Patsy (Larry's wife) must have been shopping, or sleeping or........let's just ask her. Patsy, where were you when this picture was made? The picture below is the ten Webb children! We were raised with a gentle, loving hand that could be very firm at times. My brothers and sisters are a loving, touching, caring family. In times of happiness, sorrow or need they are always there to give a hug, a kiss, a smile, and support. I couldn't have been blessed with a better family! Thank you Wayne, Polly, Bob, Al, Larry, Joyce, June, Sam and to our late sister Anna Lee. Thank you for the being the brothers and sisters that you are. From left to right on the back row: Wayne, Bob, Al, Larry and Sam. 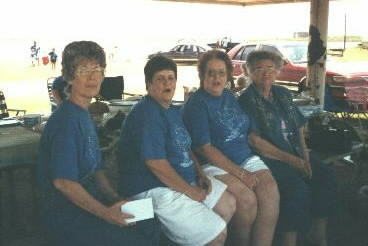 From left to right on the front row: Anna Lee, Polly, Joyce, June and Pam. Ya'll come back now....ya hear?